This is not actually a NEW new comic, just one I realized I had forgotten to post here on the ol’ home site. It was originally published by The Nib way back in June of 2018 as part of their Response feature on transgender stuffs. You can read all the Response comics here on The Nib’s site, or you can read just my comic here on Studio NDR. I had meant to have enough Taxonomically Unbound comics done to last through the end of the year. That didn’t quite happen, on account of various things exploded (my creaky old version of Photoshop, my website, my other website), and I have spent much of this month Dealing With Trying to Get Basic Things Working Again instead of making new art. One of my temporary solutions to the Photoshop explosion problem was to download Clip Studio Paint, a graphics program that’s more specifically designed for comics creation. I have not actually had time to learn how to use it due to the various website explosions, but one of my goals for the coming weeks is to at least dip into the basics. Probably gonna make some new Taxo Unbos as part of my practice efforts. I’m also working on a bunch of Valley of the Silk Sky stuff, about which I shall go into more detail next week as a sort of What to Expect in 2019 post. SO. Stay tooned! 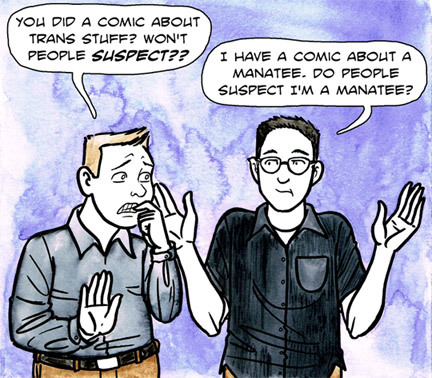 I have a new comic up on The Nib, alongside several other awesome trans cartoonists! This link right here is what you wanna click to read the whole comic and see the rest of the set. And yes, this very Sunday, June the 24th, I will be tabling at Denver Zine Fest. The event runs from 10-6, and is at the McNichols building in Civic Center Park. Come to the thing, and get yourself some zines! We’re Still Here Kickstarter is live! We’re Still Here Kickstarter is live! 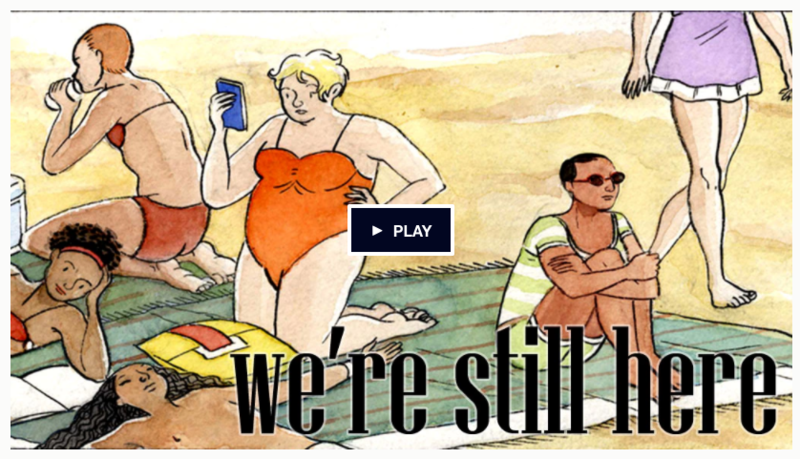 published on July 6, 2017 Read more posts by the author of We’re Still Here Kickstarter is live!, Dylan EdwardsNo Comments on We’re Still Here Kickstarter is live! My current project is my comic for the all-trans We’re Still Here anthology, and you can back the Kickstarter for it even now! This 300+ page tome is, believe it or not, the first (that we know of) comics anthology dedicated exclusively to trans comics and trans creators. And there are a ton of great folks included: Melanie Gillman, Sophie LaBelle, Sybil Lamb, Ajuan Mance, Annie Mok, L Nichols, Ronnie Richie, Bishakh Som, Scout Tran-Caffee, and tons more. Added bonus: both of the editors (Jeanne Thornton and Tara Avery) are trans, and the publisher, Stacked Deck Press, is trans-owned and operated. So every penny goes to support trans folks! I’m doing an autobio piece about my trip last fall to a Japanese trans guy bar. Folks who pledge a dollar or more a month to my Patreon are being treated to work-in-progress images. So if you wanna peep some process pix, put in a pledge! And don’t forget to back the Kickstarter and help make this book a reality! Sorry I’ve been so quiet lately. I’ve been working on a ton of freelance, but you can now peep some of the stuff that’s been keeping me busy! 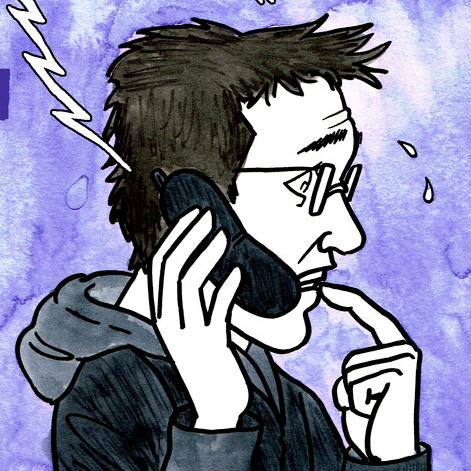 First off, check out this new comic I did for The Nib. 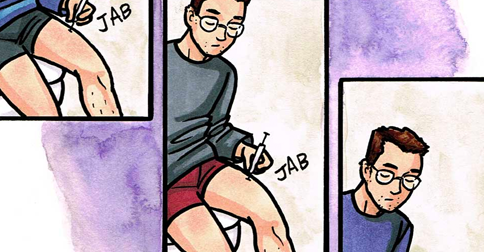 Seven whole pages of autobio comic shenanigans about being queer, asexual, and trans. I’ve also been working on a series of illustrations for Out2Enroll, a non-profit that helps LGBTQIA+ folks in California find health insurance and raises awareness of patient rights. The first two illos are up here and here, and there will be five more to come. So yeah, been busy! But pretty soon now I’ll be starting pencils on the next chapter of Valley of the Silk Sky, so stay chooned. 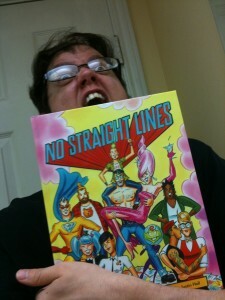 No Straight Lines is here! No Straight Lines is here! published on September 5, 2012 Read more posts by the author of No Straight Lines is here!, Dylan EdwardsNo Comments on No Straight Lines is here! I just got my contributor copy in the mail, and as you can see I am somewhat enthused by this turn of events. This is, in case you don’t know, a giant hardcover tome, published by Fantagraphics, that surveys the last 40 years of queer comics and presents unto us a selection thereof. I’m quite excited to have three of my cartoons included (one Outfield, two Trannytoons). The book includes work by a number of utterly delightful comic peeps. You can see the full roster, read some excerpts, and maybe buy? said book from the Fantagraphics website. Hopefully your local bookstore is awesome enough to have No Straight Lines in stock, but if not, well, the internets are here to help you out.